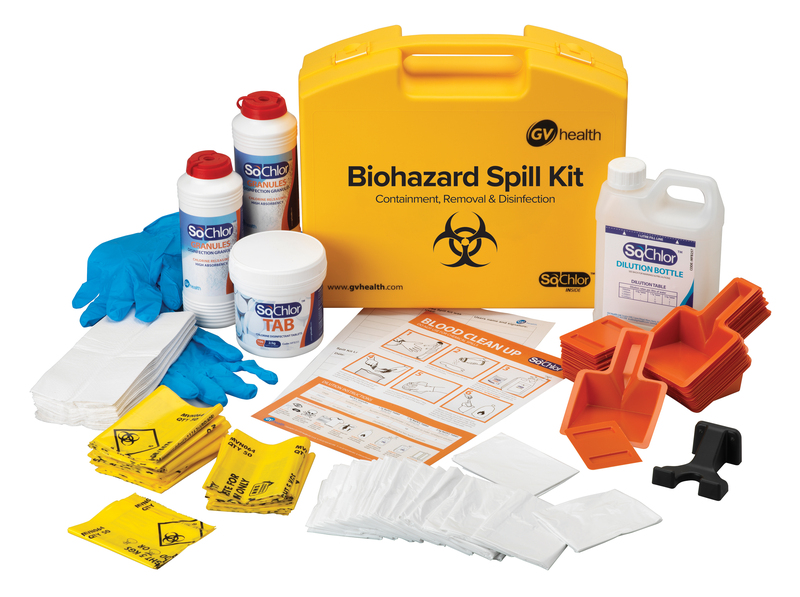 GV Health Multi Biohazard Spill Kit (up to 25 Spills). For safe clean up and disinfection of blood spillages. The Multi Spill Kit is intended for use in larger rooms and areas and where biohazard spillages occur more regularly. It contains PPE, SoChlor Absorbent NaDCC Granules and SoChlor Chlorine Tablets for up to 25 spillages. SoChlor chorine granules absorbs spill, kills pathogens on contact and reduces cross contamination risk. SoChlor Tabs dilute to produce 10,000ppm concentration chlorine disinfectant solution fully effective against blood borne pathogens and Tuberculosis(TB). Application GV Health Spill Packs and Kits exclusively hold the NHS Supply Chain contract. Multi Spill Kits are used throughout the NHS, clinics, dental surgeries, laboratories, first aid personnel in offices, care homes, schools and veterinary practices. Safe for use by non-specialist staff. The case can be wall mounted for visibility and ease of access. Conforms to UK Department of Health and WHO guidelines for safe disinfection and clean up of blood spills.